Some kitchens have been designed and constructed on the cheap and may not have a range hood. This is more common in rentals and some older homes. It can be the scourge of the home with no way to exhaust airborne grease, smoke, cooking smells, and steam out of the kitchen. If the air isn’t been exhausted it leads to a film of sticky grease and the smells of cooking for days. If your home or apartment doesn’t have a range hood in the kitchen it can be a nightmare. Grease will build up, it will create unwelcome heat during the summer, and the smell of cooking Saturday’s salmon will still be lingering well after the weekend. Try some of these tips if you don’t have a range hood. While this might not be possible in all rentals, it is worth asking about. If you own your home our team can help you choose the style, size, and placement that fits your needs. Installing a range hood will make cooking more enjoyable, minimize cooking fumes, and increase the value of your property. We custom design and install range hoods anywhere in the Phoenix Valley. If you have a window in your kitchen, or at least on close to it, you can install a window fan. Every time you cook you can set it to exhaust and it will help remove the heat and smells from your kitchen. It will not however help with the airborne grease. Even turning on fans in other rooms that are down the hall from the kitchen will minimize how long smells from cooking will linger in your home. Another option you have is to actually clean the air, if you can’t simply exhaust it. You can purchase a HEPA air filter which will help remove the cooking smells and some of the toxins from the air. This will really help when you’re cooking fish or searing meat. This way you can still get that perfect steak, burger, or tilapia without having to compromise your indoor air quality. Another way to help compensate for not having a range hood is to cover your pans with a splatter screen. The screen keeps grease in the pan instead of atomizing into the air and splattering onto the stove. This avoids buildup both on your cook top and airborne grease that will otherwise land on cabinetry and cause that sticky film. While fans, filters, and splatter screens will help minimize the amount of grease in the air, it will not match a range hood. If you don’t have a range hood or the one you have is more an ornament you should compensate with frequent cleaning. Wipe down your cabinetry often with a mixture of dish soap and water. Disinfecting cleaning wipes are also a useful cleaning resource for removing grease from your cabinets, countertops, and even the cooktop. Clean at least once a week or daily to keep your kitchen clean. You can also choose to cook in ways that don’t involve your range or cooktop. Popular alternatives include crockpot cooking and cooking outside. Crockpots might produce a little steam and let off the scent of meals cooking, but they don’t produce the toxic fumes from pan frying. Cooking outdoors on an electric skillet or grille are also viable alternatives, weather permitting. If these aren’t options try always covering your pots with lids and pans with splatter screens to minimize the affect of cooking on your home. 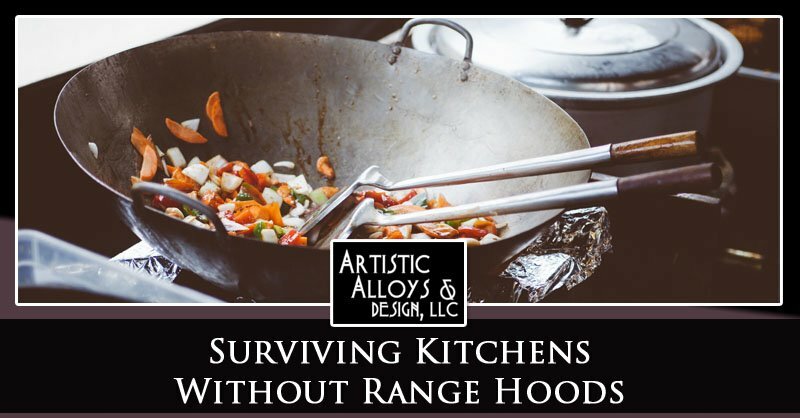 Artistic Alloys & Design is proud to offer custom range hoods in Scottsdale. We come to your home for consults, measure for your spaces, and custom design a range hood to fit your needs. Our team fabricates your range hood right here in Scottsdale, delivers it to your home, and professionally installs it. A custom range hood from our team will last the test of time, add style to your kitchen, and value to your home. please give us a call at (480) 490-2935.